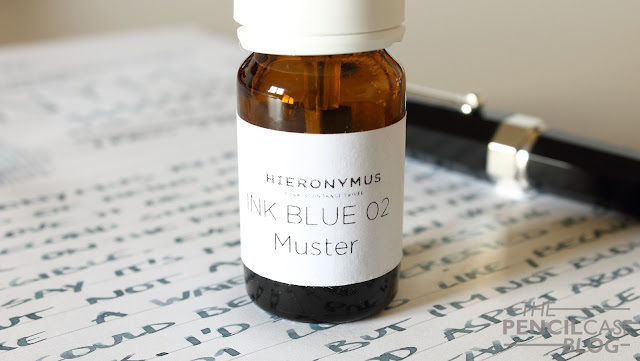 Hieronymus Blue 02 continues in Hieronymus' trend of rather unsaturated inks. 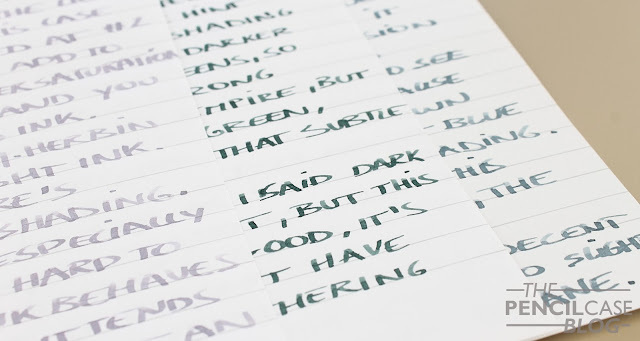 Being the 'second' shade of blue, it's a bit lighter on the page, but it's not at all illegible. The unsaturated effect is even more noticeable though, probably also because the base color is quite a bit lighter than the previous Hieronymus ink I reviewed. Blue 02 is a really difficult color to evaluate, mainly because there isn't much color to talk about... In the review of Hieronymus Green 01, I mentioned that the unsaturated style of inks works in some cases, but not in others. Well, Blue 02 is situated right on the edge of still being usable for me. Even though the name says blue, I'd say it's more of a blue-black. There's a lot of difference in blue black inks. Some are almost grey, others are hardly discernable from a normal blue. 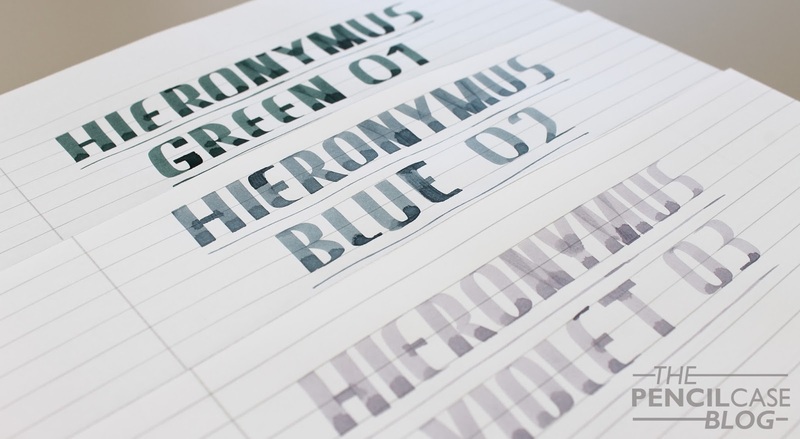 Hieronymus' Blue 02 tends more towards the grey side, but is noticeably less dark compared to a few others in the blue-black range. The very faint base color doesn't provide much visual interest. It's legible and provides a hint of colour, that's it. I personally use more saturated inks, so this is not something I'd immediately go for. It performs much like Green 01, not very lubricated, but well-behaved overall. On really bad paper it might feather just a little bit, but most kinds of paper I tried, worked just fine. A benefit from the low saturation is that it cleans out quite easily. On the other hand, it seems to have above average water resistance (not that you'd want to go stand in the rain with it!). Yet again, I'm quite undecisive about wether or not it's worth the premium. Hieronymus seems aimed at a high-budget audience, but 43 EUR for a 50ml bottle seems quite excessive! If you're really into unsaturated inks, they might offer a nice set of colours to choose from. Have you seen their prices?? 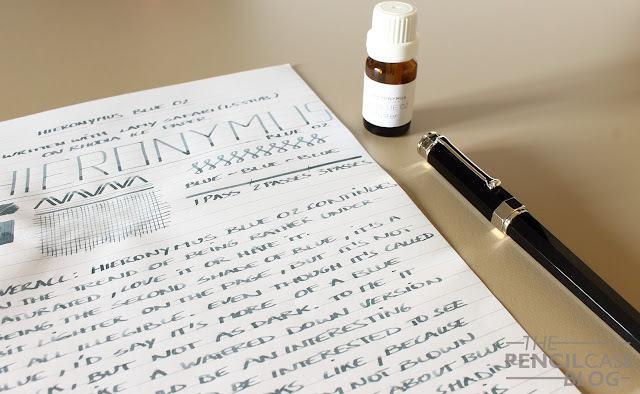 I am surely a pen nut, and a notebook nut too, but this - what can justify €40,- for a 50 ml bottle of ink? Not to speak of the rest of their collection. I am all for quality and good looks - but this is more like the Emperors new clothes. Ridiculous!